Aspirin Linked to Reduced Mortality in Prostate Cancer. Experimental evidence suggests that anticoagulants (ACs) may inhibit cancer growth and metastasis, but clinical data have been limited. We investigated whether use of ACs was associated with the risk of death from prostate cancer. 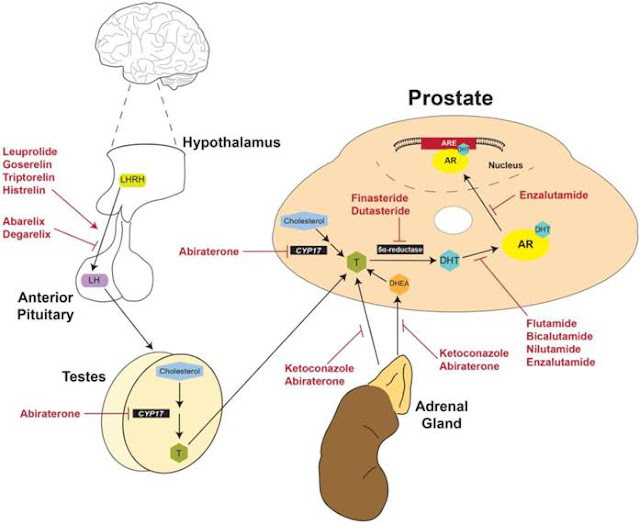 PATIENTS AND METHODSThis study comprised 5,955 men in the Cancer of the Prostate Strategic Urologic Research Endeavor database with localized adenocarcinoma of the prostate treated with radical prostatectomy (RP) or radiotherapy (RT). Of them, 2,175 (37%) were receiving ACs (warfarin, clopidogrel, enoxaparin, and/or aspirin). The risk of prostate cancer-specific mortality (PCSM) was compared between the AC and non-AC groups.ResultsAfter a median follow-up of 70 months, risk of PCSM was significantly lower in the AC group compared with the non-AC group (3% v 8% at 10 years; P<.01). The risks of disease recurrence and bone metastasis were also significantly lower. In a subgroup analysis by clinical risk category, the reduction in PCSM was most prominent in patients with high-risk disease (4% v 19% at 10 years; P<.01). The benefit from AC was present across treatment modalities (RT or RP). Analysis by type of AC medication suggested that the PCSM reduction was primarily associated with aspirin. Multivariable analysis indicated that aspirin use was independently associated with a lower risk of PCSM (adjusted hazard ratio, 0.43; 95% CI, 0.21 to 0.87; P = .02). CONCLUSIONAC therapy, particularly aspirin, was associated with a reduced risk of PCSM in men treated with RT or RP for prostate cancer. The association was most prominent in patients with high-risk disease.